To you it�s the edge of the tub. To them, it�s a racetrack, runway, launching pad, battlefield and (unfortunately) tidal wave zone. 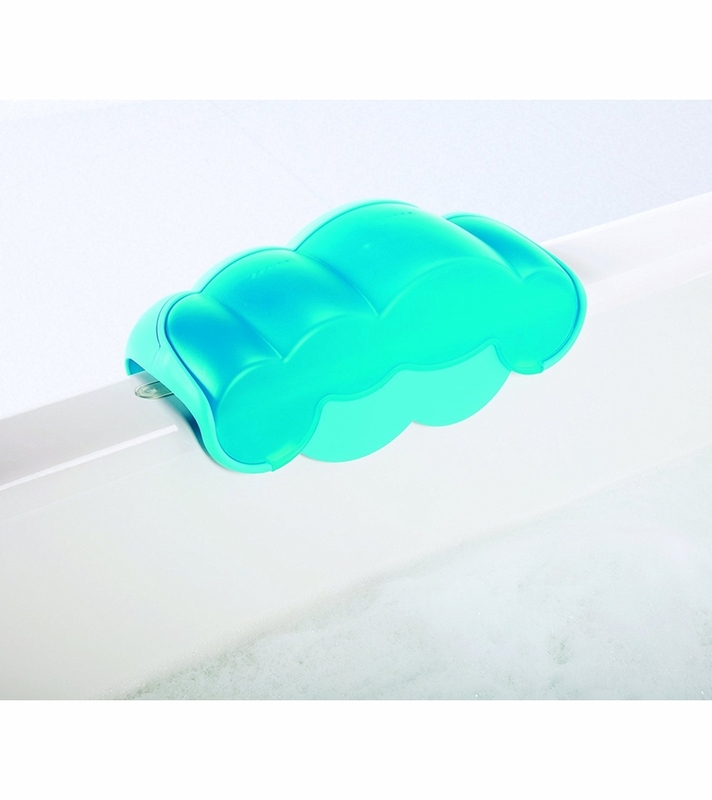 Enter Ledge, the perfect way to extend your tub�s useable play space and keep water off the bathroom floor all at once. 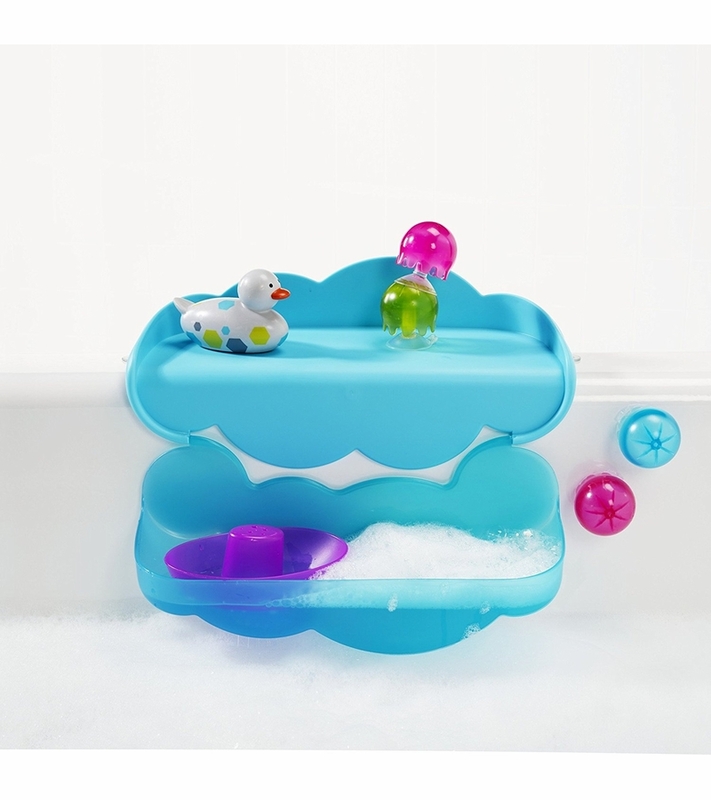 Ledge�s fold-down toy shelf allows imaginations to run wild, while drain holes keep the tub water from doing the same. How�s that for bath time brilliance? Its a wonderful product that does what it was designed to do. We don't store it and just leave it out so I don't know how good it is in that regard, but no issues with standing water the next day. My daughter loves that she can have fun in the bath tub without mom constantly trying to keep the water in the bath tub. Great product and the design is cute and simple, but I would take a brick if it keeps water from covering every surface in the bathroom like this does. Longest lasting and favorite bath toy! 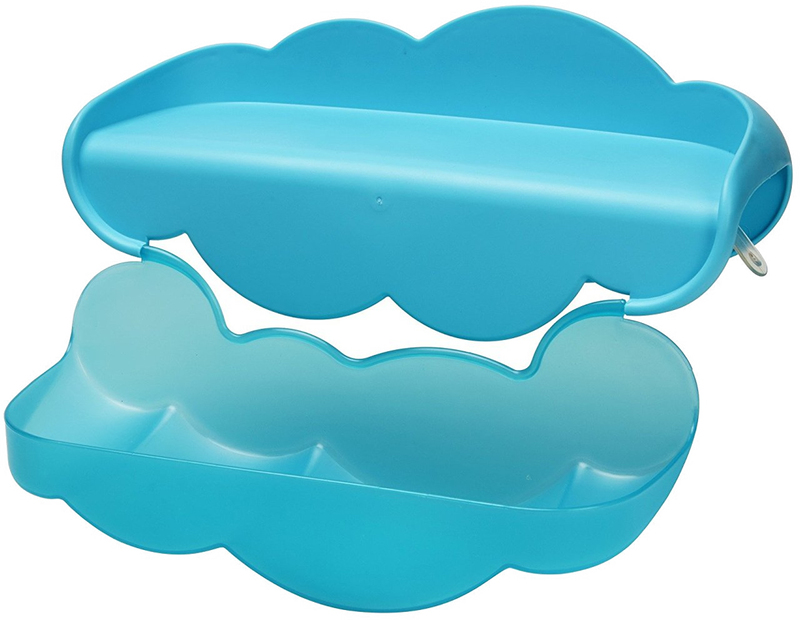 This ledge is cute, functional, and different from any other bath toy. Its hard to find different bath toys that kids are interested in for very long. I often find that my kids are interested in bath toys for very little, and everything out there is the same. My kids love opening and closing this and pouring water on it. Its also cute and great quality. My 2 year old and 10 month old really loved playing with this. It was low enough to play with their toys easily. I didn't have a wet mess on the floor to clean up for the first time! This was definitely a welcomed addition to our bathtime. I wouldn't recommend this for toy storage unless you have one very small toy. We set up the ledge in a full bath for our two-year-old son, and he enjoys putting his rubber ducks and other small toys in it while playing the tub. We don't flip it up very often, as there isn't much space for something to be stored when it's closed. 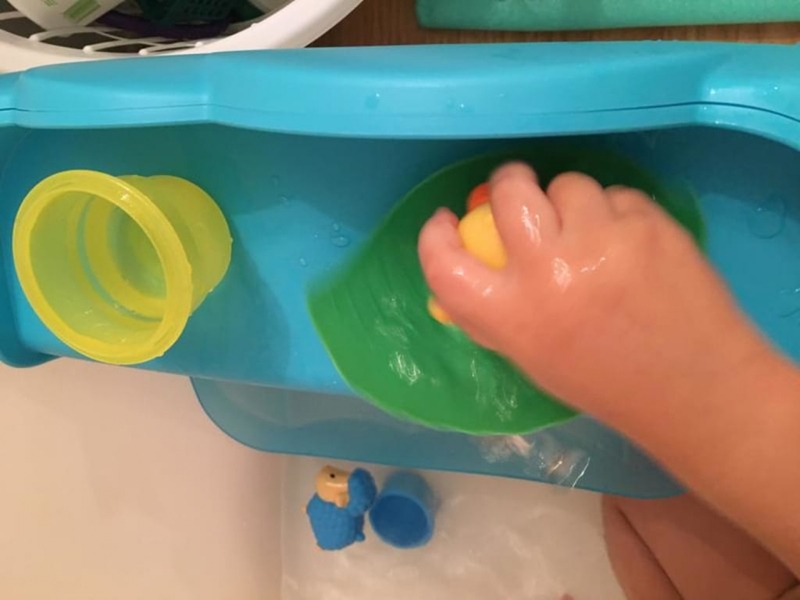 It does help with water being splashed outside of the tub, however it's limited in it's space, so our son often times overloads it, which causes the toys to fall over the ledge and onto the floor. Overall, it's a neat concept, but doesn't hit the mark for our needs. Our daughters love to line cups of water on the edge of the bathtub which results in soaking wets floors and rugs. The ledge has given them a new location for their line-ups, and greatly reduced the amount of water on our floors and rugs. 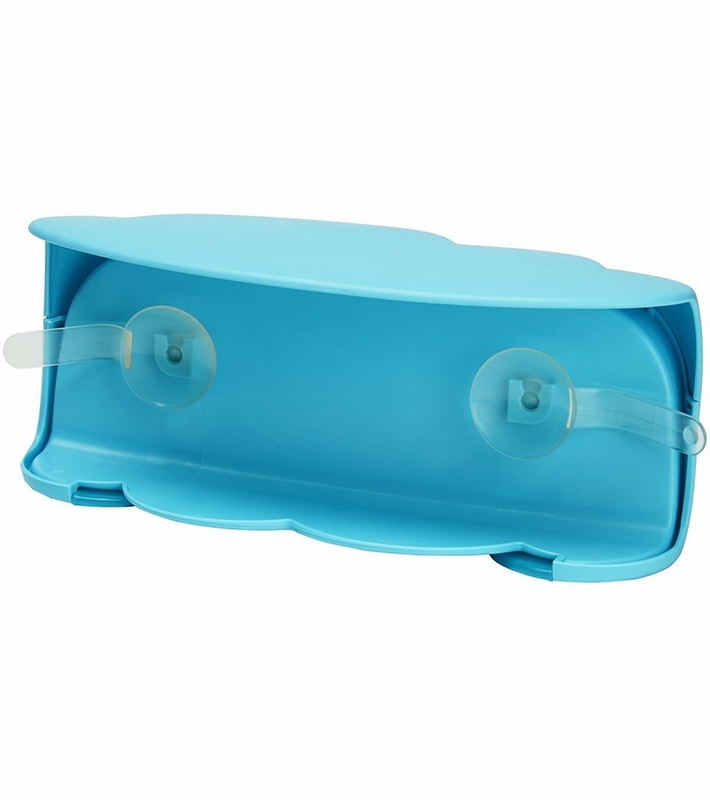 The suction cups grip the edge bathtub well with minimum movement. The girls can't pull it off which is a great bonus. Unfortunately, all of our bath toys are too large for the storage but I'm sure it would work great if our toys were smaller. The ledge works great! It fits perfectly on my tub, provides a splash zone where my son can play, and my floors stay dry. Prior to the ledge my son would race cars down the side of the tub and water would be everywhere. Now he plays with toys on the ledge and it's a win-win for us both. Helps keep water in the tub! My 3-year-old is constantly stacking, lining up, and balancing her bath toys on the edge of the tub. Not just squirty toys, but cups of water are always teetering and eventually tottering onto the bathroom floor. I am in love with this Boon Ledge! It has encouraged her to keep the toy/water collection within the rimmed ledge and keeps water in the tub instead of spilled on the floor. She loves the extra "shelf" for playing with her toys, too. The shelf closes and keeps the toys stored until the next bath. Such a genius bathtime accessory, it's been a game changer! This product works great. The suction cups hold it onto the tub even with my 8 month climbing on it. Most of the water remains in the tub but some still makes it out as is to be expected when 2 young boys (8 mon and 3yo) take a bath. My only wish was that the ledge was longer and therefore covered a longer length of tub. This is a great ledge bath product. It has great suction and is the prefect length- just long enough to play on, but it doesn't take up too much of the edge of the bathtub. It is durable, simple and functional. When my 3 yo plays on the ledge, the back of the ledge is high enough to keep the water in the tub and the bottom edge of the cloud helps the water flow back into the tub. The bottom shelf makes a great catcher for toys "jumping" into the water.While it's great for water play, it's not as functional as a toy storage method. 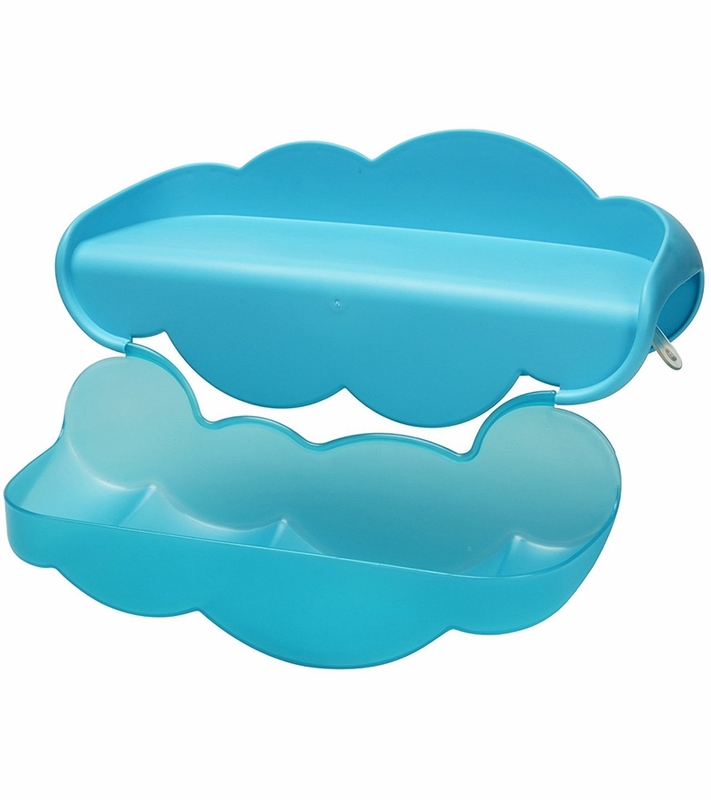 Most toys are too tall and will not allow the cloud to close properly. So if you are looking to use this as storage, you won't be very satisfied. I would say this is best used as a water play ledge! This is a great ledge bath product. It has great suction and is the prefect length- just long enough to play on, but it doesn't take up too much of the edge of the bathtub. It is durable, simple and functional. When my 3 yo plays on the ledge, the back of the ledge is high enough to keep the water in the tub and the bottom edge of the cloud helps the water flow back into the tub. The bottom shelf makes a great catcher for toys "jumping" into the water. While it's great for water play, it's not as functional as a toy storage method. Most toys are too tall and will not allow the cloud to close properly. So if you are looking to use this as storage, you won't be very satisfied. I would say this is best used as a water play ledge! The Boon brand is a family favorite so I was so excited for the Boon bath ledge. My kids love that they can play without mommy getting upset about water spilling out of the tub. I love that i can set the toys in the bottom and they will dry and not be all over the bottom of the tub. My only complaint is that the ledge really doesnt work with all tubs. Unfortunately the main tubs we use for the kids have a lower ledge that gets in the way and our master soaking tub is too shallow for the Ledge to actually work properly but we still love the product.